SANTA CLARA, Calif. (AP) -- Seven-time Pro Bowl linebacker Patrick Willis will retire after his 2014 season was cut short by a toe injury that required surgery. The 49ers made the announcement Tuesday, the first day of the NFL's new season. "Some of the greatest memories in the history of our franchise have come from his passion, dedication and sacrifice," CEO Jed York said. "Patrick epitomizes everything you could ever want in a San Francisco 49er. What he brought to this team goes much further than his athletic abilities. His leadership and infectious love for the game helped propel this team. I consider myself very lucky to have grown up around some of the greatest players in the history of this franchise, and Patrick has certainly secured his place among that elite group of men. As a member of our family, Patrick holds a special place in our hearts, and we look forward to supporting him as he moves on from his playing career." 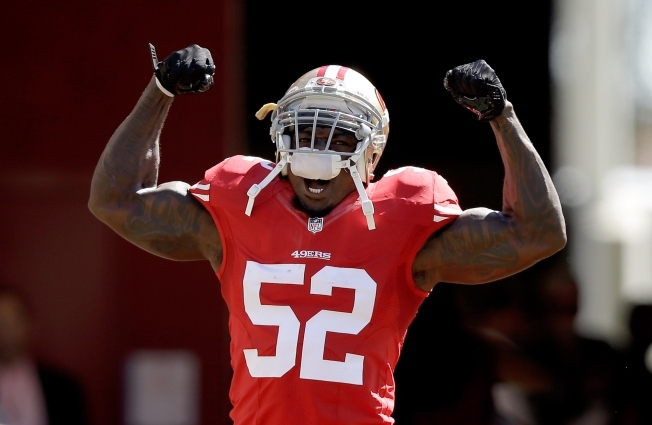 Willis and friend NaVorro Bowman had made up one of the best 1-2 linebacker punches in the NFL until both missed time last year, the entire season for Bowman as he recovered from reconstructive knee surgery. The 30-year-old Willis was sidelined with a strained muscle in his left big toe. He was placed on the season-ending injured reserve Nov. 11 after getting hurt in the third quarter at St. Louis on Oct. 13. Late Monday, Willis posted on social media a message that hinted at his farewell from football and included a series of references to bible verses. "Today is my Future, Past, and Present all in one," he wrote. "It's bigger than me, it always has been and it always will be...I thank you guys for everything, it has been an absolute pleasure .... I look forward to the continuation of my journey ... I feel full with something that needs to be out, and i just want to share it! Success is only as beautiful as our Consistency! My life is based On a True Concept! I know I'm not the only one!" Willis had missed six games in his career before this latest injury sidelined him for the final 10 games of 2014 for San Francisco, which struggled to an 8-8 finish without him and missed the playoffs for the first time in four years. "Nothing but respect for Mr @)PatrickWillis52 We been thru a lot together," free agent wide receiver Michael Crabtree wrote on Twitter. The NFL Defensive Rookie of the Year in 2007 after being drafted 11th overall out of Mississippi, Willis started 112 games and had 950 tackles with 20.5 sacks in eight seasons. Willis also had eight interceptions - two returned for touchdowns - 16 forced fumbles, five fumble recoveries and 53 passes defensed. As word spread Monday that Willis was contemplating retirement, his former teammates and opponents took to Twitter in tribute to No. 52. "Still have a chipped tooth from @PatrickWillis52 knocking me out. Congrats on a GREAT career man! Not a nicer guy out there!" quarterback Matt Leinart said. "Without a doubt the greatest man/leader/friend/teammate @PatrickWillis52 my hero!" wrote former teammate and running back Marcus Lattimore, forced out of the game by his own knee injuries last year.